Everyone’s favourite Ouma! Giveaway Time! – Lamb Loves Thyme..
Everyone’s favourite Ouma! Giveaway Time! It’s winter now, my favourite season to cuddle up and keep warm while indulging in my favourite treats. 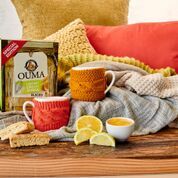 Ouma Rusks has always been a consistent staple, offering great quality products and now OUMA Rusks has introduced a new and delicious special edition to their legendary range – Lemon Cream. The iconic double-baked biscuit, which is perfect when dunked in a cup of something warm, has, over the years, become a part of South Africa’s culinary heritage. This is the rusk that has captured the heart of a nation, so the addition of this locally loved flavour combination will take a classic favourite to the next level. “Adding this new flavour to our range of rusks required extensive testing and loads of cups of tea,” quips OUMA Rusks assistant brand manager, Ziyaad Kolia. “Joking aside, it’s really an honour to work with such a wholesome and heritage-centric brand. Our new indulgent flavour is amazingly dippable, as always, and delivers a match made in Lemon Cream heaven.” OUMA Rusks is currently the number one player in the rusk market (valued at R283 million), commanding a 55.5% control of the segment. “We believe that OUMA Rusks’ Special Edition Lemon Cream flavour will inject some excitement into the category and we’re sure this will be another favourite flavour that friends and family overseas will add to their request-list! OUMA Rusks’ Special Edition Lemon Cream variant is currently on retail shelves across the country in a 450g pack. If you’re a morning, afternoon, or even midnight dipper, this wholesome treat is just for you. Tell me about your favourite moments, that you’ve had with your Ouma, and you could win an incredible hamper with delectable goodies to share!! Previous Post Fried Friday Chicken..
Next Post Yum Yum Peanut Butter Giveaway!! My favourite memory with my ouma rusks is definately sitting listening to my grannies stories drinking tea and ouma rusks. Oh that warms my heart!! Good luck for the hamper!! Hahahahaha!! You need to share! !